AUGUSTA COUNTY, Va. — After months of rallies and protests against Dominion’s proposed Atlantic Coast Pipeline, some people in Augusta County plan to watch what goes on underground from above ground. Time continues to tick as plans for Dominion’s proposed pipeline move forward. Whether the pipeline will be built is still up in the air, however the project is still concerning. RICHMOND – The push to open up records on projects like the Atlantic Coast Pipeline died in the House of Delegates on Thursday. House Bill 1696 was killed in committee on a near-unanimous voice vote. The bill, introduced by Del. Dickie Bell, would have made public utilities subject to sunshine laws on projects where the company is allowed to exercise eminent domain. “Eminent domain is a powerful tool, I’m sure everybody in the room knows that,” Bell, R-Staunton, said during a hearing before the House Commerce and Labor Committee. New York Governor Andrew Cuomo made headlines at the end of last year when he announced a ban on hydraulic fracking in his state. That was unquestionably a victory for environmentalists, but in neighboring Pennsylvania, however, fracking is still underway. This summer, I visited the northeastern region of the Keystone State to see what the the front lines of America’s shale gas boom looks like. Far off the radar of Google Maps, I found Craig Stevens mowing the front lawn on his 115-acre property in Susquehanna County. Craig, a former National Rifle Association recruiter, hasn’t had a drink from his faucet in about a year and a half, and for good reason. The salt and storage wells of the Watkins Glen brine field lie 2,000 feet below the network of small roads just north of the US Salt plant on Seneca Lake in New York. The Village of Watkins Glen is just outside the picture to the south. In the 1960s, a 400,000-ton block of rock fell from the roof of an old salt cavern in the Finger Lakes region of New York — a cavity that new owners now want to reopen and use to store highly pressurized natural gas. The Midwestern energy company that seeks a federal permit for the storage project has denied knowing the roof failure ever happened. And the Federal Energy Regulatory Commission (FERC), which is poised to rule on the company’s permit application, has never publicly acknowledged the event. Groups fighting the storage of propane gas in salt caverns near Seneca Lake sounded an alarm, noting that a gas explosion that severely damaged a hospital in Mexico City on Thursday came from gases identical to those Crestwood Midstream wants to store here. The Mountain Valley Natural Gas Pipeline that’s being proposed to run through South Western Virginia made a U-Turn when it came to Floyd County. Last fall, the gas companies changed the original route, bypassing the rural county. Company officials have said the protest movement that sprang up in Floyd had nothing to do with their decision, but others believe it made a difference. One of them is Mara Robbins, who founded the Preserve Floyd Movement last summer to fight the pipeline. Now, she’s been hired by an Environmental group to continue that work throughout the region. 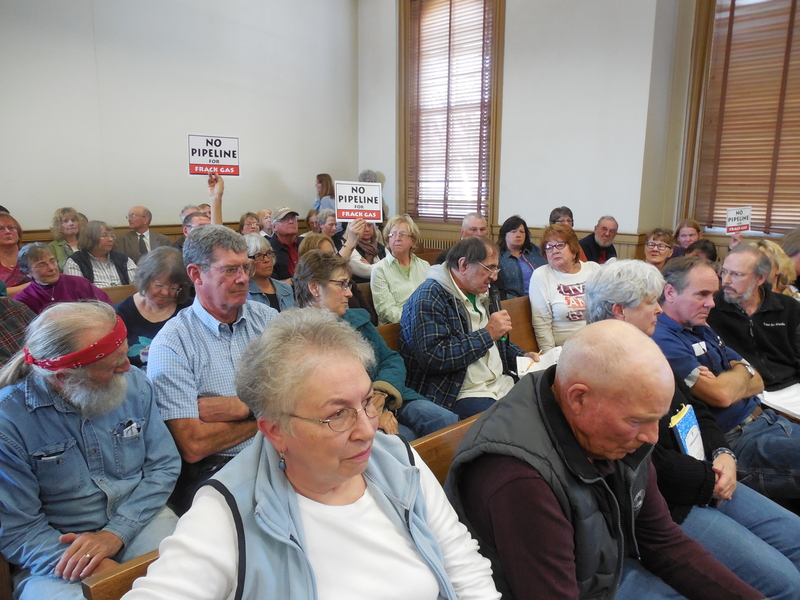 At a community meeting in Union, W.Va. last November, a hundred citizens voiced their concerns for the proposed Mountain Valley Pipeline. On January 21, the US. House of Representatives passed House Resolution 161, known as the Natural Gas Pipeline Permitting Reform Act. The resolution directs the Federal Energy Regulatory Commission to approve or deny pipeline projects within 12 months after receiving a complete application.